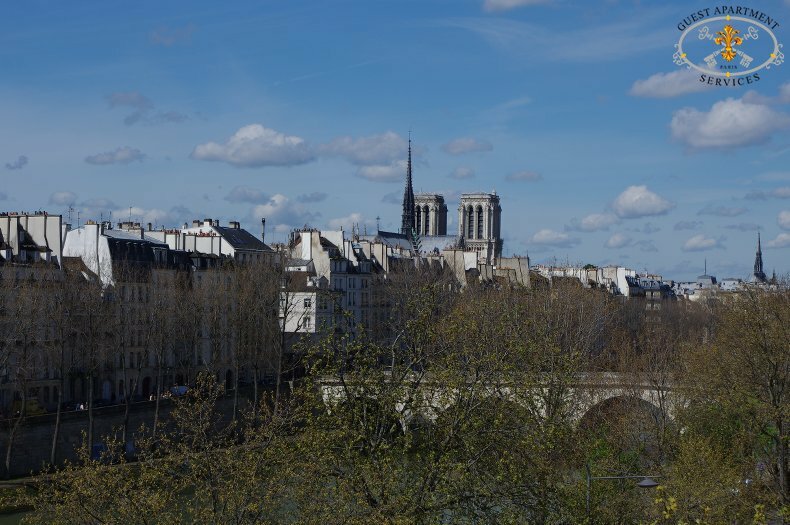 The location of the apartment in the little-known, chic Saint Paul neighborhood is a perfect starting place for strolls to the Notre Dame Cathedral, the Ile Saint Louis, the Louvre or the Bastille. 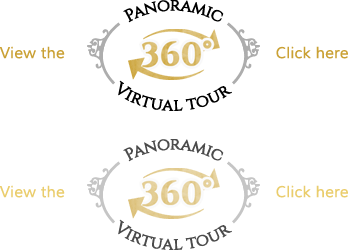 Le Marais is an area that is known for its diverse history. During the 17th and 18th centuries it was the royal district, popular with the French aristocracy. By the 19th century, it had taken a more industrial and creative turn as it became popular with artisans. 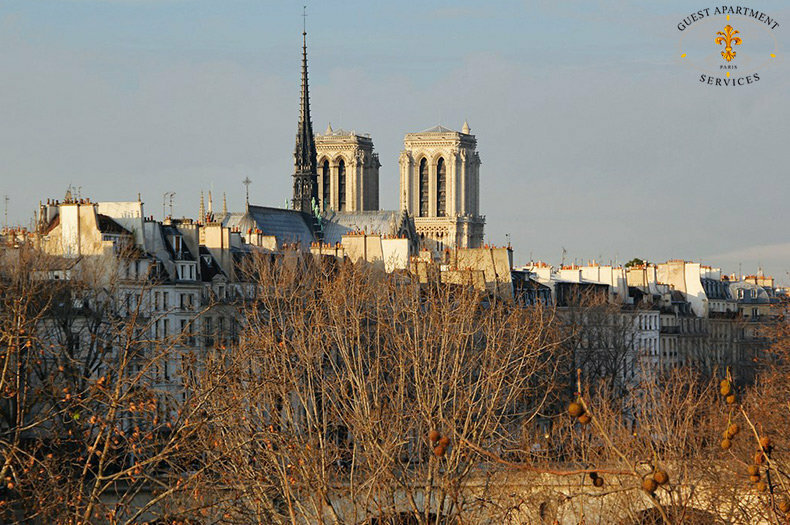 It is this feeling that has stayed with the Marais and today the area is bustling with creativity and innovation. Antique shops, restaurants, boutiques are numerous along the main north and south axis of Rue Saint Paul. 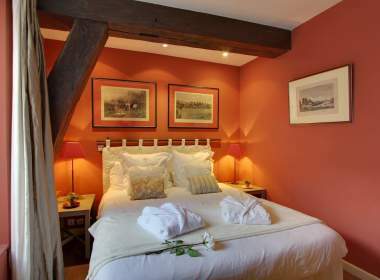 In the past, the building has been the location of Hotel La Vieuville (sixteenth century). The estate remained in the family until 1741. 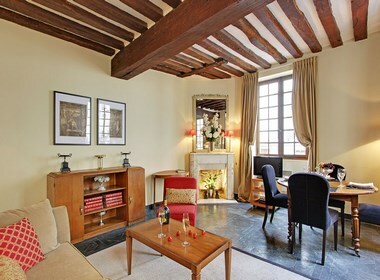 From 1777 to 1793, the hotel was owned by the couriers and delivery services from Paris to Lyon. 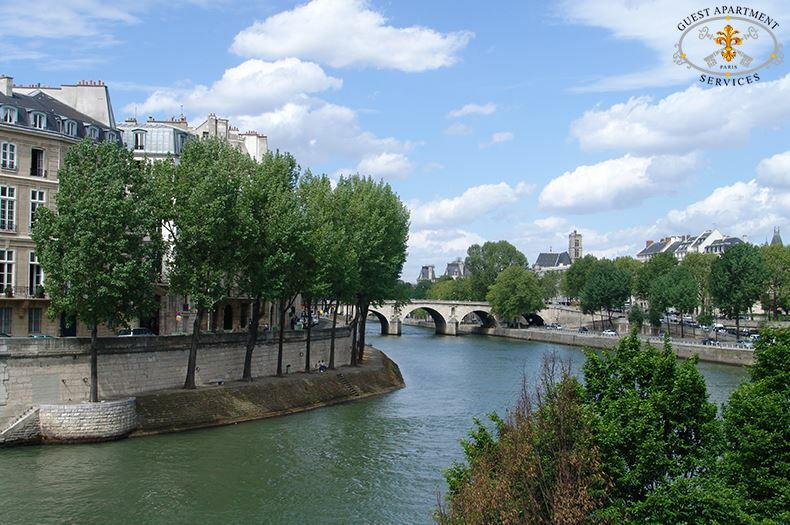 In 1822 there was installed a sewage treatment and clarification of the Seine water. This hotel was demolished in 1927 to make room for the warehouses of the department store La Samaritaine. They were built in 1935 with bricks and stone to remind the Louis 13th style, prevailing style of the neighborhood. In 1981, these warehouses were destroyed, exception of the façade to build 151 luxury apartments. The work has been conducted by the architect Franco Cesari. Having pushed the majestuous wooden door secured by a digital code, you will enter directly into an imposing marble lobby that open on a private courtyard. Reaching the fourth floor, the elevator opens on an elegant foyer. 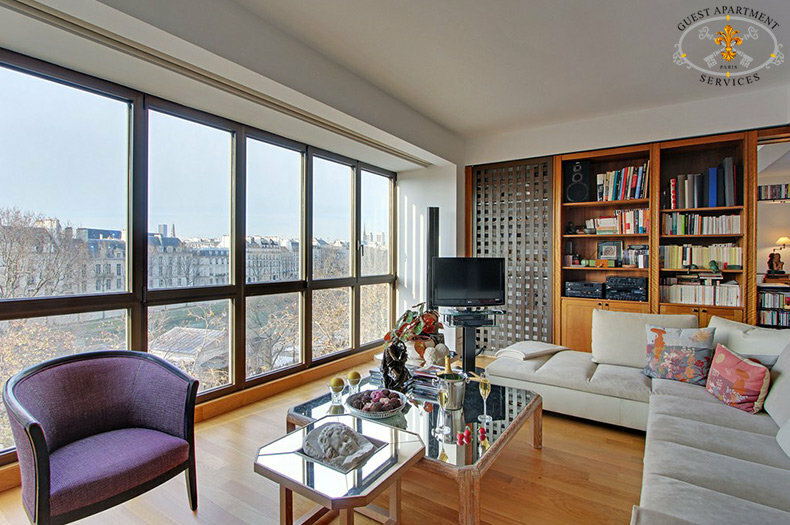 This unique apartment, benefiting from a south-western view, is always full of light. 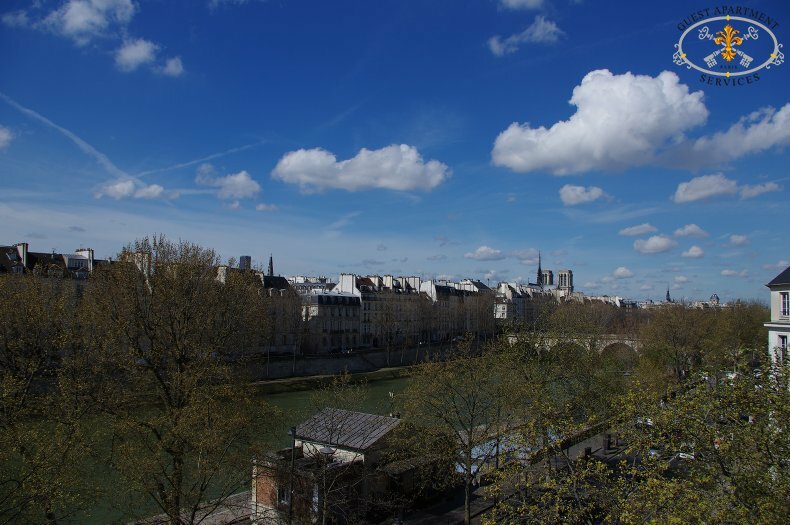 It offers an incredible view on the Seine River and its bridges as well as the romantic Ile Saint Louis. Entering the apartment, from the foyer entrance, you will immediately feel the space and the modern comfort. 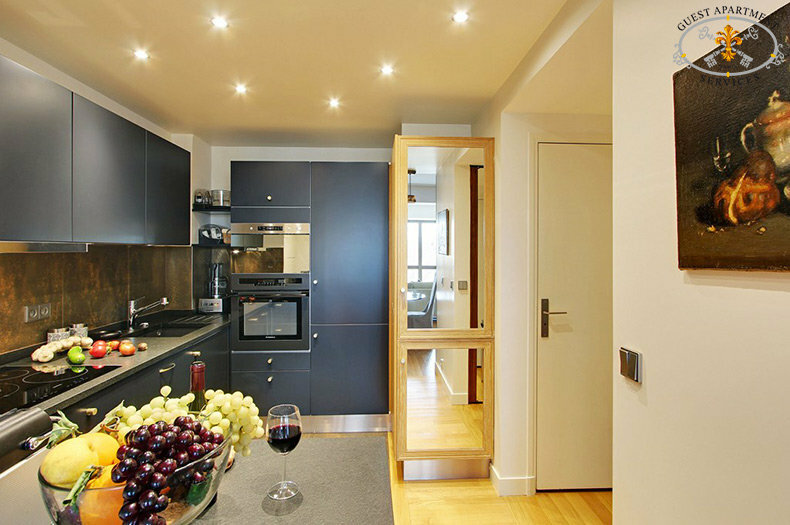 It has been designed to be open, allowing a sense of light and energy to flow freely throughout the apartment. 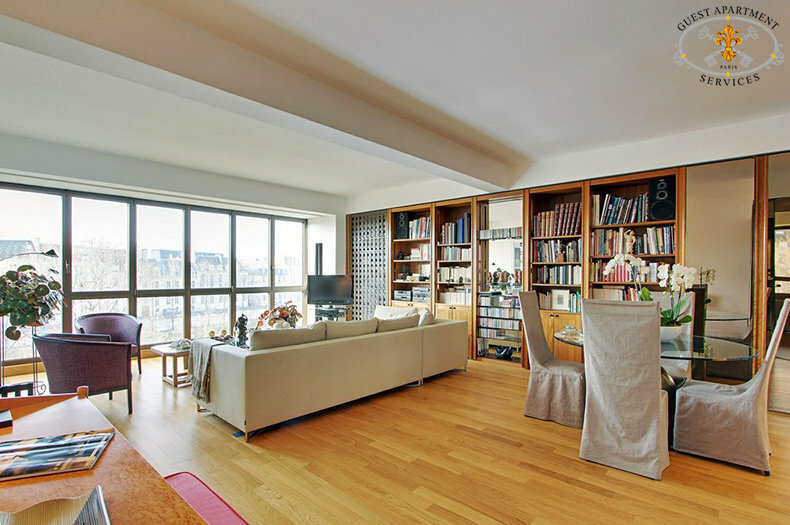 The entire floor of the apartment is built of natural oak. The living room’s window is built to project outward. 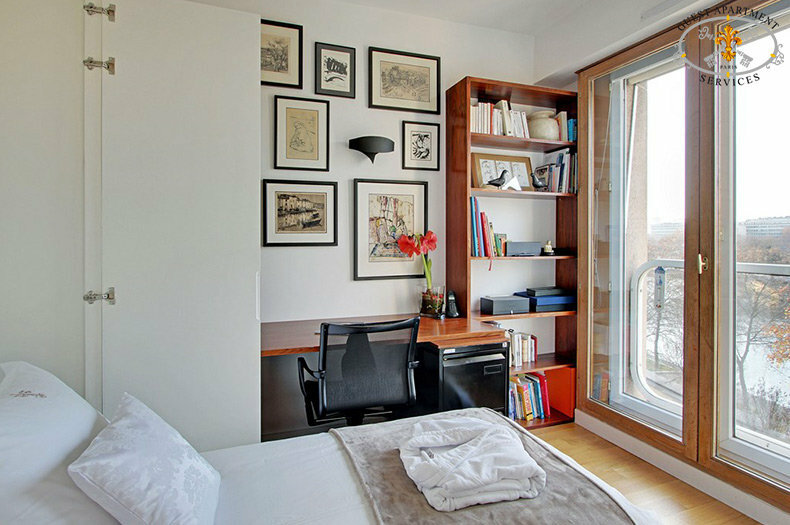 It provides the light for the apartment, reflecting it in numerous mirrors craftily placed. 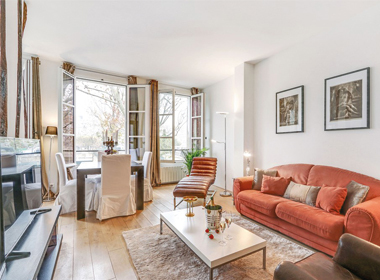 Here you will find a large creamy colored sofa, facing the outstanding view on the trees line bordering the quays of the Seine River and Ile Saint Louis. The living room is completed with a large cocktail table and two lilac armchairs. An entire wall is dedicated to a built in wooden library. An electrical metal rolling curtain create a protecting shade during the sunny days, together with an air conditioning unit to keep a cool temperature. Behind the living room area is the dining room, where a glass dining table with four comfortable chairs compose this elegant atmosphere. This is an invitation place for private and romantic dinners. 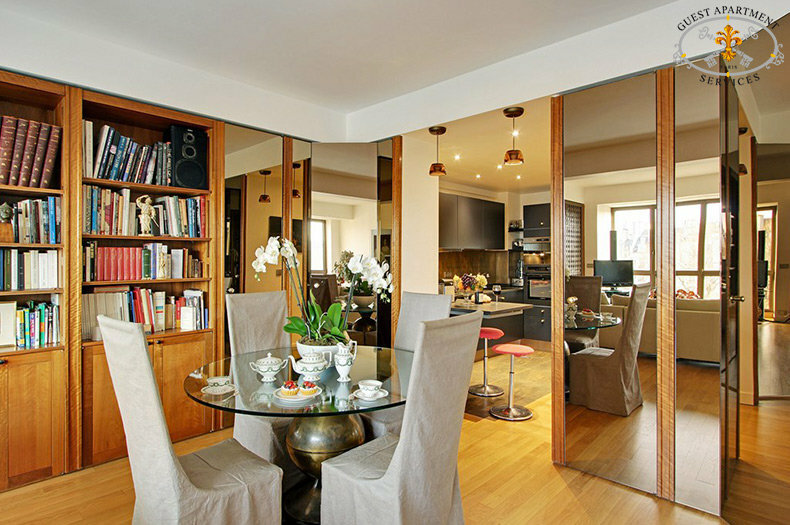 An art deco working desk adorned with an elegant portrait complete the cozy ambience of the dining-living space. 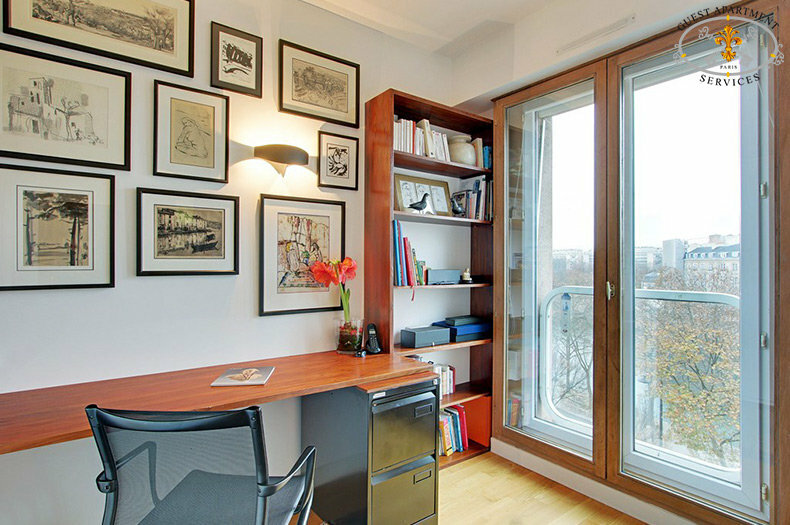 Next to the living room, the opened office is appointed with a desk for laptops convenience. The wall is decorated with genuine etchings and lithographs. Hidden in the wall cabinet a trundle bed pulls out to sleep an additional guest. 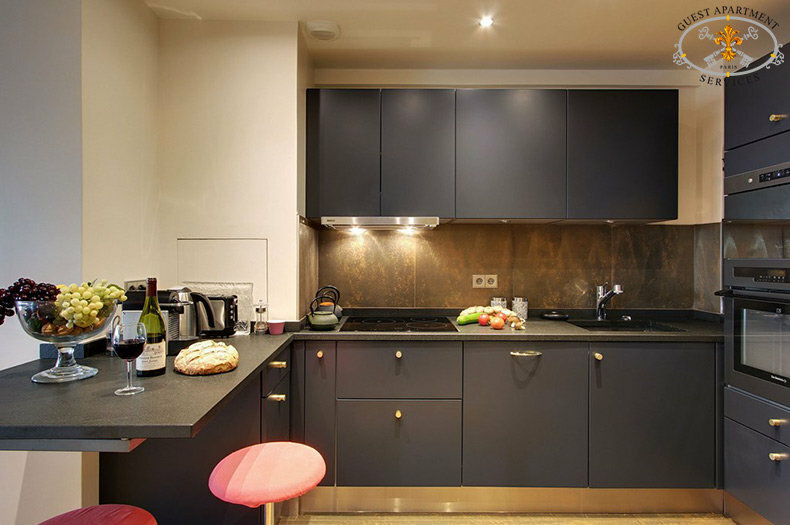 The modern and stylish open kitchen has been set up to provide convenience and efficiency. All main electrical items are present: refrigerator and separate freezer, a dishwasher, a washer and a dryer, induction plates, a microwave unit, toaster and Nespresso machine. This part of the apartment is dedicated for very convivial meals. The bedroom welcomes a new queen size bed. The bed head is equipped with separate reading lamps. An entire wall is a built in storage for clothes. 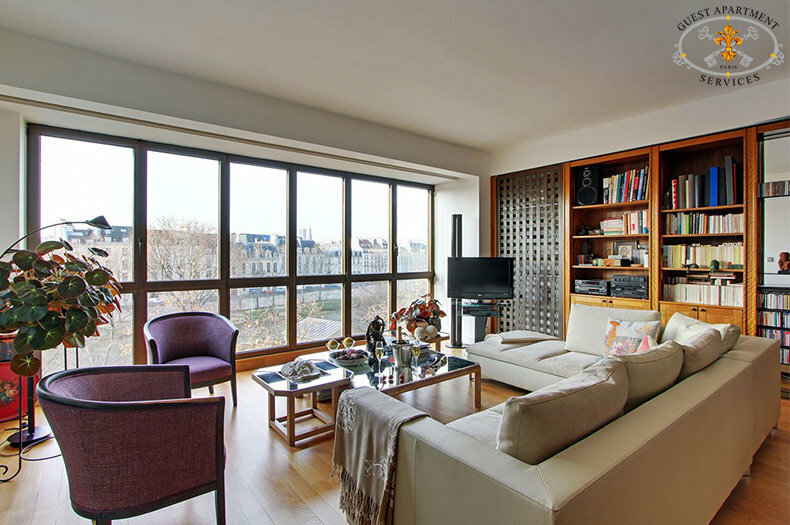 The window offers stunning views of the river banks of the Seine River and Ile Saint Louis. 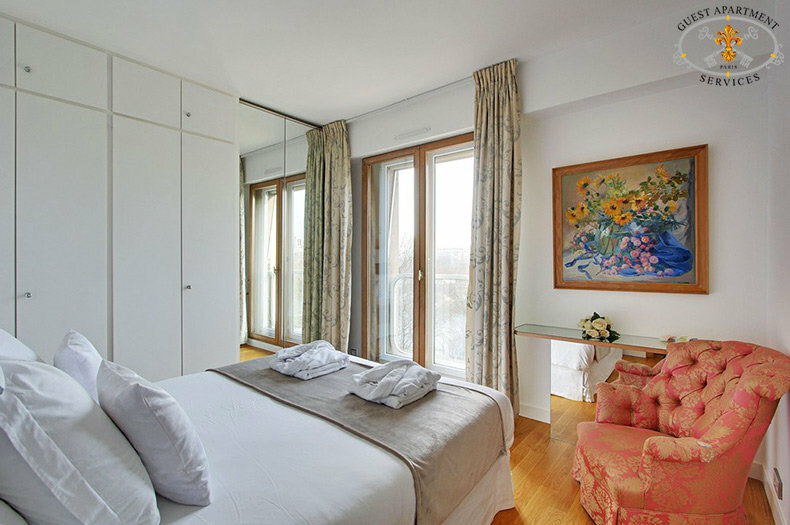 The bedroom is equipped with an air conditioning unit. 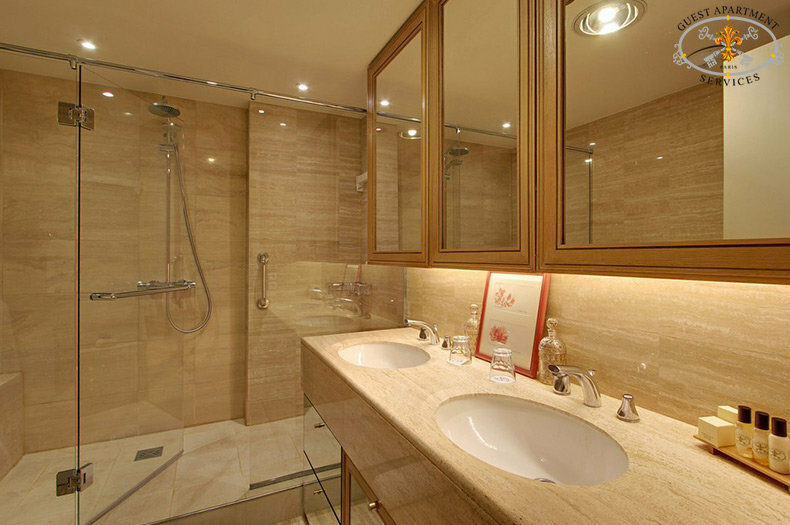 Next to the bedroom, the bathroom is appointed with a large & luxurious walk in shower, two wash hand basins and a lavatory. 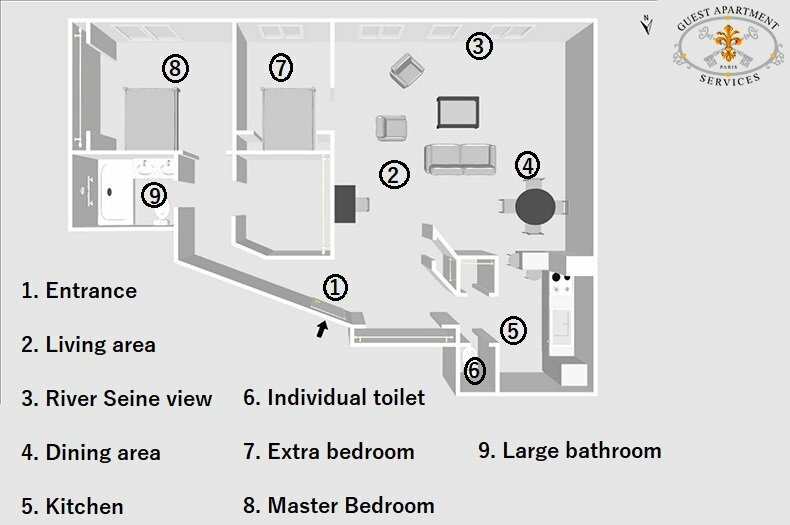 A separate second lavatory is available in the entrance hall before the kitchen. For your complete comfort, other appliances are present: Cable TV, with the main international channels CNN, BBC, Hi-fi stereo system with CD-player. A private Telephone line is available with answering machine. This property has the added benefit of free unlimited WiFi access. The architect-decorator who designed this 85 square meters apartment did not miss a detail to make this Parisian home as comfortable and pleasing as possible. Check in time: 3pm; Check out time: 11am.